The factionalism and infighting in the state BJP has come to the fore following denial of party ticket to the local former BJP MLA and ex chairman of the HPTDC Rakesh Pathania, who today alleged that he was politically sacrificed due to his undisputed and consistent loyalty to former Chief Minister Prem Kumar Dhumal. The dithering of the BJP High Command on the leadership issue in the state has not gone down well within the partymen in the lower areas of the state, particularly with the candidates who had been contesting the assembly elections from Kangra district, they are convinced that absence of Shanta Kumar from the electoral arena will badly affect their winning prospects. 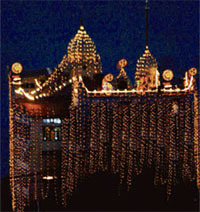 With the BJP high command delaying a decision on the contentious leadership issue, supporters of Shanta Kumar, who have been already given the party ticket, will shortly meet the central leadership to impress upon it the need to make the former union minister contest the Assembly election as it would directly affect the party’s prospects in Kangra and some other districts. Aiming to replicate UP’s social engineering formula in Himachal Pradesh, the BSP today released the list of 45 candidates for the second phase of Assembly elections in the state. The party has fielded its chief ministerial candidate Vijay Singh Mankotia from Dharamsala instead of the Shahpur constituency. Policy makers of the BJP in the state had in principle decided not to give the plum posts of chairman of the corporations, directors of the boards and senior office-bearers in the party organization to those persons, who would be elected as members of the state legislative assembly, if voted to power. 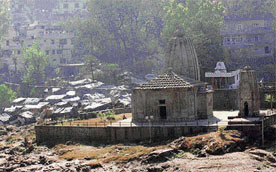 The 290-year-old Panchvakhtar Mahadev temple, located on the rocky bank at the confluence of the Beas and Suketi in the heart of this temple town, being protected as a national monument by the Archaeological Survey of India (ASI), faces threat not only from the illegal mining of the riverbed, but also trash and junk being dumped near it by over 30 jhuggi dwellers and the Mandi Municipal Council (MMC), turning the ancient site into a “defecating and dumping site”, thus giving an unpleasant experience to the visitors. The District Magistrate has directed all arm licence holders residing in and around hypersensitive polling stations of Doon and Nalagarh to immediately deposit their weapons at the nearest police stations. The directions were issued following a review of sensitive polling booths in the two constituencies by the district administration and the DGP himself. The Department of Food and Civil Supplies (DFCS) has restored the ration cards of 143 poor Antodaya families of Hamirpur allowing distribution of ration to them at cheaper rates through the public distribution system (PDS). The decision came after the National Human Rights Commission (NHRC) issued notice to state government on the basis of a news report published in The Tribune in its issue of September 29. Former telecommunication minister and veteran Congressman Sukh Ram Sharma said good bye to electoral politics today at a function of workers at Kotali, his native village, near Mandi town. Governor V.S. Kokje and Chief Minister Virbhadra Singh have felicitated the people of the state on the occasion of Guru Nanak Dev’s birthday. Kokje said Gurpurb symbolised world peace, love and brotherhood. Virbhadra Singh said the teachings of Guru Nanak Dev were even more relevant today. He said the he was a great spiritual ambassador who showed the world the path of peace. Burying all differences, the workers of BJP Kasauli constituency today thronged in good number at a party meeting held at Dharampur near here. The meeting was convened to chalkout the party strategy for the coming poll. The workers seemed to be in an upbeat mood after the ticket allocation to Dr Vijay Saizal, a youth haling from Gandhi Gram village, near here. With the allotment of ticket to its candidates by the BJP, the contestants have kicked off their campaign in their respective constituencies. The Chamba district comprises five assembly constituencies. The elections to the Bharmour tribal assembly constituency are over, while the four left-out constituencies are - Bhattiyat, Banikhet, Rajnagar (SC) and Chamba. The prestigious Shimla Municipal Corporation (MC) will now seek the help and guidance of Chinese experts in protecting its rich heritage, which is being lost in the maze of concrete structures all over the erstwhile summer capital of the British. A Chamba resident has been sent a telephone bill by BSNL although he does not have a BSNL connection. Reacting to a news report, “Gang of idol smugglers busted”, carried in these columns on October 6, 2006, Nalagarh-based advocate Hem Raj Sharma has claimed that his client Ravi Kumar’s name has been published wrongly and without any basis. With the departure of palanquins of Lord Parshuram and other deities after the holy dip in Renuka Lake on the occasion of Kartik Purnima, the five-day state-level Renuka fair concluded this evening. Bambar Thakur, a youth Congress leader and member of the zila parishad from Samoh ward of the district, has revolted against the party and declared to contest the Assembly election from the Bilaspur (Sadar) constituency as an Independent candidate. The Election Commission of India has directed the candidates and political parties to ensure that vehicles for campaign plied only with the prior approval of the returning officer. General secretary of the Pradesh Congress Committee Kuldeep Singh Rathore yesterday charged BJP leader P.K.Dhumal with misleading the people on the Rs 800-crore financial assistance being given by the World Bank. Agitated over the allotment of BJP ticket from the Shillai constituency to Baldev Tomar, party workers of Shanta and Dhuman factions, who were fighting each other till yesterday on the ticket issue, today came on one stage and jointly decided to field Amar Singh Chauhan as an Independent candidate if the party did not change its decision in two days. 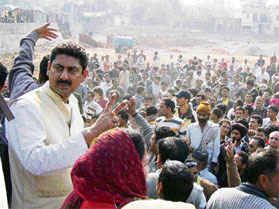 A large number of party workers raised slogans in support of Amar Singh Chauhan. They assembled in a ground in front of his residence at Paonta Sahib and held a rally. Workers warned the party high command that “if the ticket was not allotted to Chauhan in two days, they will leave the party and support his candidature as an Independent candidate”. More than 20 BJP workers belonging to both factions alleged the party high command has always played a cruel joke with Shillai party workers by not allotting the ticket to a winning candidate that was why the party could never register a win at Shillai over the past 30 years, they said. Agitated workers advised the top leaders of the party not to visit Shillai if the ticket was not changed. They warned they would not be allowed to enter the area for campaign. They said the party had always ignored ground realities in Shillai and allotted the ticket to undeserving persons, thereby allowing easy wins to the Congress. Amar Singh Chauhan announced that he was very much in the field. To honour the sentiments of workers, he was ready to fight as an Independent candidate, if the ticket was not changed, he announced. He said that for the first time in the political history of Shillai, BJP leaders of all factions had come under one umbrella and with this unity their “win was sure”. He announced that a big rally of party workers would be organised on November 27 at Shillai where the final decision would be announced. He said resolutions signed by hundreds of BJP workers had been faxed to the party high command demanding change in the ticket as the present candidate was little known even among the party workers in the area. After coming from Delhi today, he addressed a press conference here this afternoon and pointed out that he had given two days ultimatum to the party high command to reconsider the allotment of the party ticket to malvika Pathania, who had a Congress backround and had even lost her security deposit in zila parishad elections in the area. But following consistent pressure of the party cadre and the BJP supporters of his native Nurpur assembly constituency he had decided to fight the election and win. He added that he was filing his nominations on November 29 as a true soldier of the BJP even if the party high command did not reverse its decision. When asked was he not supposed to wait for two days before the end of the ultimatum period he remarked that he did not foresee any re consideration in this connection. Pathania alleged that his name was struck off as a party candidate just to scuttle the way of the BJP stalwart Prem Kumar Dhumal to be the next Chief Minister of the state. He lamented that some anti party elements were active in the BJP organisation and it seemed that the organisation was being played in their hands. He said these elements had only one point programme to dislodge Prem Kumar Dhumal from the post of the Chief Minister if the BJP was voted to power in the state. “The party was not serious in forming the next government in the state,” he lamented. ]The reports received from the BJP high command said Shanta Kumar may not be asked to contest the assembly election from Palampur. This has caused widespread resentment among the rank and file of the party. Senior leaders of the BJP admit that the absence of Shanta Kumar from the electoral arena would cost party over six seats in the district alone. Meanwhile, 10 BJP leaders, including MLAs, former ministers and ex MLAs in a joint press note issued here today flayed the strategy of the BJP high command to hold back the captain of the team from entering the field. They said this decision would not only affect the poll in the district but the entire state. These leaders urged the BJP high command to review its decision and allow Shanta Kumar to contest the assembly election from Palampur, which is his home constituency. They said there was a wave in favour of Shanta Kumar, as he was not only a senior party leader but had a clean image, if he was not in the field, it would take wind out of the BJP sails. Majority of the Shanta loyalists, who have got a major chunk of the tickets for the 16 Assembly segments in the biggest district of Kangra, held a meeting in Kangra to discuss their strategy today. Besides meeting Atal Bihari Vajpayee, L.K. Advani and Rajnath Singh, they could also undertake a signature campaign to convey their opinion to the high command. Mankotia, who had won from Shahpur five times, was named the party candidate along with other nominees at a press conference by party general secretary and in charge of Himachal affairs Man Singh Manhera. Besides Mankotia, two former ministers, Vijay Kumar Joshi (Santokhgarh) and Kewal Singh Pathiana (Nurpur), and former legislator Haridutt Sharma (Chintpurni) figured in the list. All three had left the Congress along with Mankotia. The list contains the names of only two women, Chameli Devi (Thural) and Kamla (Theog). Manhera said winnability was the major criterion for deciding candidates. Onkar Singh Rana, a close confidant of Mankotia, will contest from Shahpur. A close look at the list indicated that a majority of the candidates were from upper castes and the Congress and the BJP dissidents, indicating that the party was targeting the vote bank of the two mainstream parties. Answering a query, Manhera said the BJP and the Congress dissidents, who had been denied the party ticket, were welcome in the BSP fold. Sources said the party had held back the announcement for the 20 seats with a view to accommodate dissidents from the Congress and the BSP. “We are in touch with them,” he added. The following are the other candidates: Randhir Ranta (Rohru), Mahant Ram Chaudhary (Ballah), S.P. Gautam (Sundernagar), L.S. Mastana (Mewa), Manjinder Singh Bika (Paonta Sahib), Darhsan Singh Saini (Doon), Vinod Thakur (Nalagarh), Suresh Sharma (Baijnath), Sanjay Chaudhary (Kangra), Ved Parkash Thakur (Shimla), Vinod Kumar (Palampur), Bhim Singh Kesri (Karsog), Nanak Chand Bhardwaj (Dharampur), Jagdish Reddy (Chachiot), Uttam Singh Chauhan (Darang), Rakesh Bhardwaj (Jogindernagar), Bhikham Singh Pangotra (Guler), Hans Raj (Gangath), Vicky Mankotia (Jawali), Ramesh Khola (Jawalamukhi) and Des Raj (Gagret), Hari Om Sharma (Jaswan), Yash Pal Thakur (Nadonta), Surinder Kumar Sharma (Bamsan), Loki Nand Sharma (Banikhet), Parkash Chand Bhatia (Pachhad), Prithi Singh (Renuka), C.D. Singh Guleria (Sulah), Som Dutt Bharwal (Una), Sukh Ram Chauhan (Kotkhelur), Rajinder Mohan (Mandi), Kant Sharma (Bilaspur, Sadar), Brij Lal Chauhan (Ghumarwin), Sukhdev (Gehrarvi), Harish Chander Dogra (Chopal), B.N. Mehta (Kumarsain), Uttam Singh Kashyap (Kasumpti) and Rajwant Manta (Jubbal-Kotkhari). The basic idea behind this decision was to tackle factionalism within the party. Few disgruntled leaders, who had not been granted the party ticket had threatened to quit the party. Shanta Kumar, national vice-president of the party, was of the view that everybody could not become MLAs or ministers, but the deserving candidates, who had been ignored in the allotment of party tickets could be adjusted as chairman of the corporations, directors of boards and senior office-bearers in the party organisation. He was hopeful that there would be no serious threat within the party that could come on the way of the poll prospects of the BJP. “The BJP is going to form the next government in the state and there is no doubt in it”, he said. There were reports of the outbursts of local level BJP leaders from few more constituencies. Sources in the party high command had revealed that the party president Rajnath Singh and senior leader L.K. Advani had asked both Shanta Kumar and Dhumal to keep their loyal workers/leaders under control by convincing them that they would be adjusted on key positions in the government and the party after coming to power. It was learnt that both top leaders of the party in the state who are aspiring to become the Chief Minister had started contacting their loyal workers/leaders requesting them to keep quite, otherwise, the chances of the party to come in power could be diminished. Jai Ram Thakur state president of the BJP was hopeful that the problem created by the disgruntled leaders would be tackled smoothly within two days. When The Tribune team visited the ancient monument, which boasts of Panchrahtiya Grabhgriha (five-chariot sanctum sanatorium) that enshrines “Sadashiv” stone idol, it found that over 30 jhuggis have come up nearby, with its inhabitants turning its surroundings into a defecating site that emits foul smell. The trash and junk litter the site around the temple. The visitors have to face a lot of inconvenience as children and others can be seen defecating in the open. The temple was built by Mandi King Sidh Sen in 1717 AD and is declared as a protected monument under the Ancient Monuments and Archaeology Sites and Remains Act, 1958. The entrance to the foot bridge, which connects the temple site to the town, welcomes the visitors with heaps of trash being dumped on the left bank of the Suketi river by safai karamcharis of the municpal council and residents living nearby, revealed art-lovers of the town. “Mandi is a temple town and like Trilokinath temple in old Mandi, Panchvakhtar Temple is one of the great monumental attraction for tourists”, said Anees and Mary, the two tourists who had come to visit the site. The illegal manual mining is going on in the nearby riverbed. A number of mules carrying “bajris”, boulders and sand bags can be seen daily at the riverbed site under the nose of the Mining Department, which always cribs about the shortage of staff to check the menace. K.C. Nauriyal, superintending archaeologist, ASI, said, the temple’s original beauty has been restored. He said, “We have requested the MMC to keep away the jhuggis, maintain cleanliness and disallow mining around the site as it brings visitors to the town. We hope the administration will help us”. As per these directions, the weapons will remain deposited till one week after the announcement of the election results. As a precautionary measure, the district magistrate had earlier banned carrying of firearm across the district till the completion of the election process. With a steep rise in crime in these two bordering constituencies, the district police has already enhanced its staff strength and has demanded additional vehicles for patrolling. As the area has a huge migrant population and not much information is available about their whereabouts, it has become imperative to keep a strict vigil on the nefarious elements. The area has also reported a number of cases where the crop protection gun licences have been used in minor and major scuffles among the local people. The administration has identified 22 hypersensitive polling stations in the Doon segment and 17 in the Nalagarh constituency. The following have been termed hypersensitive in the Doon constituency: Manlog-Kalan, Diggal, Ramshaher, Patta (Mehlog), Khera I and II, Lodhi Majra, Bhud, Baddi I and II, Sandoli I and II, Bilanwali-Labana, Suraj Majra, Gullerwala I and II, Barotiwala I and II, Suraj Majra, Labana and Mandhala I and II. Saur, Bagheri, Rampur I and II, Gullerwala (Karsoli), Joghon (Jagatpur), Joghon (Banyala), Baruna I and II, Rajpura (Rangwal), Rajpura (Harijan Colony), Dhabota, Rampur, Dhang Nihala and Manjholi I and II have been named hypersensitive in the Nalagarh constituency. The department had cancelled the ration cards of these families due to discrepancy in the list supplied by the Hamirpur nagar parishad after a fresh survey of Antodaya families. The discrepancy came to light after the parishad office was flooded with a large number of complaints from Antodaya families that their ration cards had been cancelled under the Antodaya category. An investigation revealed that it had happened due to discrepancy in preparing the list of these families by the the nagar parishad. He said now he would not contest any election in future and that his son was now be his political successor, who would contest elections from Mandi Sadar as a Congress candidate. He said he had brought revolution in the field of communication and informational and technology in the country and in Himanchal Pradesh . He said he was thankful to the people of Mandi as he had won 12 elections in the past and represented Mandi assembly segment and the Mandi parliamentary constituency in various capacities. He said that the formation of the Himanchal Vikas Congress (HVC) was his political compulsion as when he was falsely framed in corruption cases he did not leave the Congress but was expelled from the party. In that event, he had to form the HVC and at that time the Congress got 31 per cent votes and the HVC got 29 per cent in the assembly elections and emerged as a strong political party. He said now in future he would not contest any elections but would campaign for Congress candidates in the state. He appealed the people to vote in favour of the Congress so that the Congress government was formed for the betterment of the state. A major crisis had surfaced within the party over ticket allocation, after 17 nominations were received for Kasauli seat. However, all seemed well in today meeting after a major portion of party workers expressed joy over the ticket allotment to Dr. Saizal. Finally, the party leadership has given importance to youth power by giving ticket to Dr Saizal, opined most of workers after the meeting. The party now has a good chance to win from the seat that has so far been a Congress stronghold, the workers maintained. Terming factionalism as a non-relevant issue now, Dr Saizal said he had full support of party workers. The BJP believed in democracy and everybody had the right to make his or her claim open, he said over the filing of 17 nominations for the seat. The BJP has fielded Gp Capt Bhupinder Singh Chauhan from Bhattiyat, Renu Chadha from Banikhet, Mohan Lal from Rajnagar (SC) and Bal Krishan Chauhan from Chamba assembly constituencies as its party candidates. Meanwhile, the other aspirants who had been denied the party ticket may pose a great threat to the BJP’s official candidates. But, what would be the trend of their role in the electioneering of their party would be apparent only after December 3, the last date for withdrawal of candidature. Although in today’s’ politics there is no place for any ideology of any political party, but it is only the maneuvering and manipulation of the leaders and workers to allure them towards their vested interests. Political parties have only names without ideology. The mayor, Narender Kataria, informed that an agreement had been signed between the Mayor Associations of the two countries at Delhi. “There is a lot of similarity between the rural areas of Himachal and China, so we will get a lot of assistance from Chinese experts in regulated development,” he said. He said the modalities would be worked out once the agreement signed between 12 Chinese mayors and 17 of their counterparts from India. These will be discussed at the mayor’s conference at Chandigarh on December 7. He said a three-day conference will be held to discuss the issues at length. With China having done a lot of work in preserving its heritage, the historic structures in Shimla, some of which have been venue for several important decisions pertaining to Independence, could be preserved. Tek Chand of Ulansha village of the district says he has been sent a bill of Rs 1,514 for the month of September and Rs 122 for November on telephone number 01895-200324. He said he had applied for a BSNL connection in June. As there was no response from the service provider for several months, he got a connection from a private telecom company. However, when he went to the BSNL office for getting his name struck off, it issued him a bill of Rs 1,636 for two months. In a communication to The Tribune, Sharma has stated that Kumar appeared as a prosecution witness in the case and had given evidence before the court of Chief Judicial Magistrate, Rampur. Describing the news item as “false” and “incorrect”, he has added that the client had no hand in the offence. The Tribune correspondent adds: The news report was based on the information provided in a press conference by the then deputy inspector-general, central range, Mandi. It was carried in all the newspapers in the state. Governor V.S. Kokje participated in the departure ceremony of deities and paid obeisance to Lord Parshuram and Renuka Ji. Several thousands of devotees witnessed the departure ceremony, performed on the bank of Renuka Lake as per tradition, paid obeisance to Lord Parshuram and took part in the ‘vidai yatra’ of palanquins. Devotees also took holy dip in the lake. Governor asked people to follow the principles established by Lord Parshuram. He stressed the need to preserve ancient culture and traditions. Thakur, accompanied by a former zila parishad member and Dalit leader Basant Ram Sandhu and Bamta punchayat’s former president Baldev Thakur, declared his intention to contest as an Independent candidate at a largely attended rally in Bilaspur yesterday evening. Bambar criticised prominent Congress leader and forest minister Ramlal Thakur and Bilaspur (Sadar) MLA Tilak Raj Sharma. He said he had been compelled to take this step due to these leaders. Chief electoral officer Manisha Nanda said here today that the permit issued by the returning officer should be displayed prominently on the windscreen. The permit issued should be of a sufficient dimension so that was visible from a distance. It should bear the vehicle number and name of the candidate in whose favour it had been issued, she added. She said the list of permits issued should be given to all observers and in case of any addition, the intimation should be given to them. The responsibility of enforcing these instructions would lie with the district police chief of the district concerned, she added.